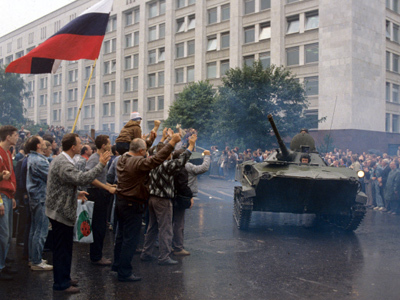 The events of just three days in August 1991 changed the course of Russian history. But they also became a sort of watershed event for the country's military and its role in politics. ­In a desperate attempt to "save" the Soviet Union and prevent the signing of a new treaty that would grant the republics much more autonomy, eight hard-line Communist officials formed a State Committee for the State of Emergency, known as the GKChP. The country's top military leader, Defense Minister Dmitry Yazov, became one of those eight. And he wasn't alone in his involvement in the coup attempt. Deputy defense ministers and various top-ranking military commanders all had a hand in the plan. The head of the airborne forces, Pavel Grachev, was among the conspirators. "My role as a commander of the airborne troops was to move one or two divisions into Moscow in case violence broke out in order to protect high-security objects and prevent bloodshed by keeping parts of society from fighting each other," he recalled. With the military and the Security Services (KGB) at their command, the coup organizers quickly – and quietly – established control. They placed Mikhail Gorbachev under house arrest at his Crimean country home, detained a number of people deemed “potentially dangerous,” increased the military presence around objects of state importance – and by August 19, were ready to sweep into self-proclaimed power. ­"The first couple of days were quite scary,"
That's when we had to take over the high-security objects to protect them, and there were crowds of people gathering, and violence was on the verge of breaking out – while the local governments in Russia's regions were just biding their time to see who wins so that they could then decide on their positions." But it wasn't just local politicians who were not rushing to pledge allegiance to the members of GKChP. Doubt began seeping through the coup members' minds almost as soon as the attempt began in earnest. Only nine Communist-controlled newspapers were published on August 19, and independent radio and TV channels were shut down. Every channel in the country was showing just one thing: the “Swan Lake” ballet. But the elegance on screen did not mask the clumsiness of the coup attempt. Grachev was just one of many military men doubting his actions. “And it was enough to see these people's face – especially when the “Swan Lake” broadcast started – to know that they have no future. The smartest of them was Interior Affairs Minister [Boris] Pugo, who realized that he was being drawn into this conspiracy and was honest enough to shoot himself. That's what all of them should have done, but they didn't have enough willpower." 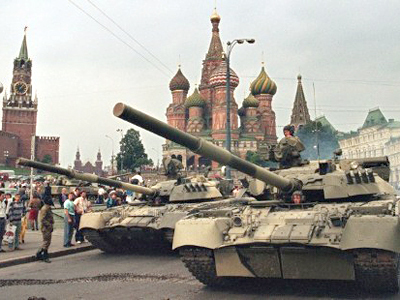 As the first day of the coup attempt unfolded, Russian President Boris Yeltsin came down to the White House and addressed the troops gathered there; he wanted to persuade them to stand down and not take part in an unconstitutional plan. His actions and words, on top of the general sense of confusion and indecision from the coup organizers, are what many believe prevented more bloodshed in the Russian capital – and forced many in the military to switch sides. Sergey Yevdokimov, a former tank commander, remembers those days all too well. "When we entered Moscow, we had no idea what was going on,” he said. “When my unit deployed in front of the White House, we were given the papers: printouts, Yeltsin's decrees and so on. Upon reading them, I guess I knew what was happening, who was right and who was wrong, and who was breaking the law and who was acting against them [the GKChP]." Many of the army men felt that way. And even those determined to stay true to their military oath and carry out their orders began second-guessing themselves. 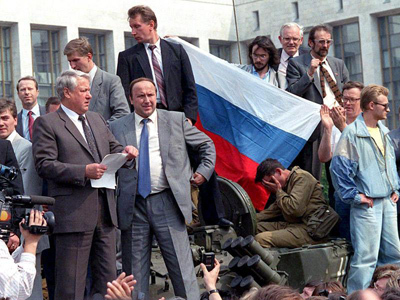 Brachnikov did go, and managed to talk to Yeltsin – who immediately called for the major to stand before him. "Yeltsin was in his office," recalled Yevdokimov, the tank commander. Rutskoy and General Kobets, who was in charge of the White House defense, went to meet us. Together we went to the negotiations room. They explained again what was happening. I replied that I realized who was wrong and who was right. 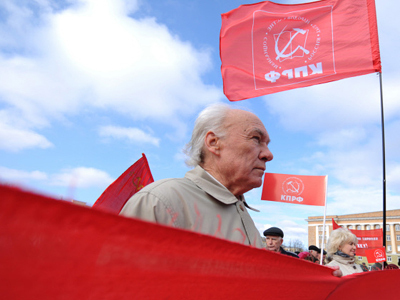 Rutskoy said, ‘Do you understand that the State Committee on the State of Emergency (GKChP) are criminals?’” he continued. To this day, historians argue over the reasons the coup failed. Many have claimed it was precisely because the organizers failed to act tougher and use the military at their disposal. Others believe that those orders would have simply been disobeyed. 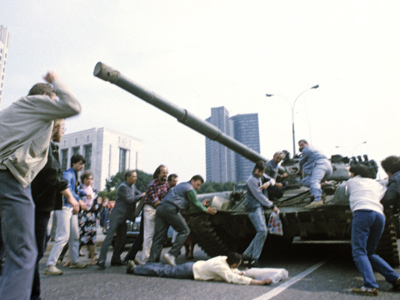 There are even some who think the military did nothing but bide its time, and the pretense of joining Yeltsin's supporters came at the same time as the understanding that the coup had failed. But for those who were actually in Moscow during those three days, it was a nagging sense of something wrong taking place, at a time when confusion reigned and hopes were high, that made them doubt the GKChP. "At 8 a.m. I realized that some kind of a mess was going on, when we woke up to the sound of an alarm, and were ordered to march toward Moscow,” he said. “I thought that I'd figure it out when I got there, as we weren't given any information about what was happening. Upon our arrival, I learned about the GKChP and realized that it was a criminal organization performing a coup d’état. So I acted against the GKChP on the side of Yeltsin and the defenders of the White House." These are the memories of just one soldier deployed to the White House – and there were hundreds more like him. Ultimately, their actions – or lack thereof – were the reason the White House wasn't stormed and thousands of people stayed alive. "So after I got the orders to attack the White House and apprehend Yeltsin in the evening, I had a meeting with my deputies and colleagues in our headquarters,” recalled Grachev. “And we unanimously decided that we would not proceed to attack the White House no matter happens to us, all the more so because it was obvious to us by then that the GKChP wouldn’t succeed, whereas the blame for the bloodshed would be laid at my door. I was sure that they would have lied that they had never given me the orders, and that I undertook the attack on my own." Was it fear, common sense or hopes for a better future that stopped most of the military personnel involved in the coup from resorting to force? Even now, 20 years later, it's impossible to say. But their choice ultimately caused the final, irreparable crack to the foundation of the Soviet Union – and gave the hope of democracy a way in.